What do you call the different nest of animals? The nest of a Badger is called a “Sett”. A Sett is a Badger’s den that usually consists of a network of tunnels that can accommodate 15 or more animals, with up to 300 meters of tunnels and as many as 40 openings. It takes many years for the animals to dig these large Setts. The tunnels are usually between 0.5 to 2 meters beneath the ground, and they incorporate larger chambers used for sleeping or rearing young. The nest of a Beaver is called a “Lodge”. Lodges are created from severed branches and mud. The Beavers cover their lodges late every autumn with fresh mud, which freezes when the frost sets in. The mud becomes almost as hard as stone. The lodge has underwater entrances to make entry nearly impossible for any other animal. The nest of an Eagle is called an “Eyrie”. Eyries are large structures that are much larger the size of the bird and these are often used for many years. The nest of a Hare is called a “Form”. Forms are shallow depressions or flattened nest of grass built and used by Hares. The nest of a Pheasant is called a “Nide”. A Nide is a brood or nest build by Pheasants. The nest of a Squirrel or Ringtail Possum is called a “Drey”. Drey is the nest of a Squrrel. It is built outside (as opposed to cavity). They will make their own Dreys but sometimes will occupy a vacant Drey. 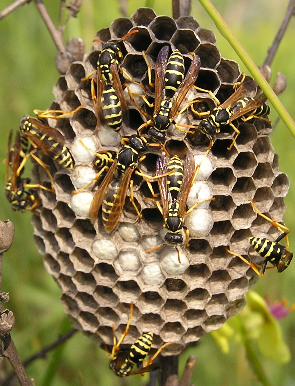 The nest of a Wasp is called a “Vespiary”. The nest of a Wasp is unique. They are made of paper-like materials.